Find great ideas for using Active Learning methods and equipment on our Pinterest page. Active Learning is an approach based on the work of Dr. Lilli Nielsen. It is not just a piece of equipment, such as a "Little Room" or a HOPSA dress, but rather it refers to a total approach, for instructing individuals with severe multiple disabilities. It contains an assessment, a curriculum, specifically-designed equipment, and instructional strategies that support learners to be active participants in their surroundings. This approach is closely tied to evidence-based research, such as the work of Jean Piaget's developmental stages of learners. It views the child's development holistically, including not only motor, cognitive, and sensory skills, but also social and emotional development. Watch this video to see how Active Learning is used at the Penrickton Center for Blind Children. What type of learner benefits from an Active Learning approach? The Active Learning approach can be used in conjunction with other approaches, such as the work of Dr. Jan van Dijk. Though initially this approach was designed for individuals with visual impairments and deafblindness, it has proven to be effective with individuals with other signicant disabilities, such as autism and cerebral palsy. It is an approach that can be used with all learners, but is most effective for those who have significant multiple disabilities and are functioning in the 0-48 month developmental level. The Active Learning approach can be used with individuals with various visual conditions, such as CVI (Cortical Visual Impairment) and ONH (Optic Nerve Hypoplasia), as well as with those who are deafblind or medically fragile. We invite you to explore the world of Active Learning! Share your ideas and questions. Watch this video to see how a boy progressed from lying prone on a Resonance Board to being upright in a HOPSA Dress to sitting independently! These videos were made over a 4 year period. The boy in this video is the same one as the news video above, in which his mother discusses what a difference Active Learning has made for her son. Jack's progression from passive to active learner is evident in the video. In the beginning clips Jack does not sit independently and has very little ability to move himself into different positions to explore and experiment with things around him. Over time, through his own actions, Jack builds motor and sensory skills as he becomes more engaged with the world and people. These interactions allow him to develop fundamental concepts necessary for all future learning. As he moves more vocalizations and communication skills develop. His interactions with others helps to develop critical social and emotional skills as well. Download flyer in PDF format or as Word document. Here are a list of sources for purchasing some of the specific materials shown on this website. Kits for thumb pianos, harps, etc. Cheaper versions do not have the spring action in them. Steel tongue drums are significantly cheaper, but are not as large, overall flat so limited tactile features, and are heavier thus not giving the same quality of sound, sensory feedback, or movement options. Each color has a specific set of tones inside them that are pleasing to each other when they ring. Each color chime has a different set of tones. Available from a number of sites, including Amazon. Active Learning is more than equipment or materials. It is an approach that can be used to implement instruction in general curriculum and expanded core curriculum, and also to support therapies such as physical therapy, occupational therapy, music therapy, and speech therapy. These ideas can also be used in the home or community. Use the appropriate educational technique (see the Five Phases of Educational Treatment). Match your pace to the learner when you interact. Follow the learner's lead in any activity. Don't over-react or over praise the learner - if the child becomes upset, simply move on or if the child demonstrates a skill simply comment on what he/she has done. Be aware of the type of skills the learner is working on in the activity or environment, e.g., in the Little Room the focus is on tactile/motor/auditory not visual skills. Select materials that are based on the child's sensory preferences and developmental level. Arrange materials so the learner has physical access to explore independently. Position the learner so he/she can move optimally. Remain silent during the child's exploration - share simple feedback when the learner takes a break or at the end of the activity. Allow plenty of time for the learner to respond - for some learners this may be minutes rather than seconds. Recognize that the child needs to work at their current skill level and will attempt higher level skills when the learning cycle has been completed (see Dynamic Learning Circle). Observe the child and your own interactions - videotape the child and/or the adult during instruction periodically. Use a wide variety of materials with differing properties. Change only one feature at a time in the materials or environment. You may want to use this Active Learning Planning Sheet form to help your team get started planning for your student. Description: Two clips illustrate how important adult expectations are and what a difference the environment makes in encouraging learning and active engagement. In the first clip a young boy lies on a swing in a supine position. His lower body is covered with a blanket. In the second clip, just a few minutes later, the blanket has been removed and Active Learning materials have been placed all around the boy. A bead clamp is suspended above his legs, an elastic board under his right arm, and a door stop board under his left arm. There is silver metallic crinkle paper under his head. Active Learning is an instruction approach for individuals of all ages who are still developmentally in the sensorimotor and pre-operational stages of learning. It can be utilized to teach most any content at a developmentally appropriate level for these learners. 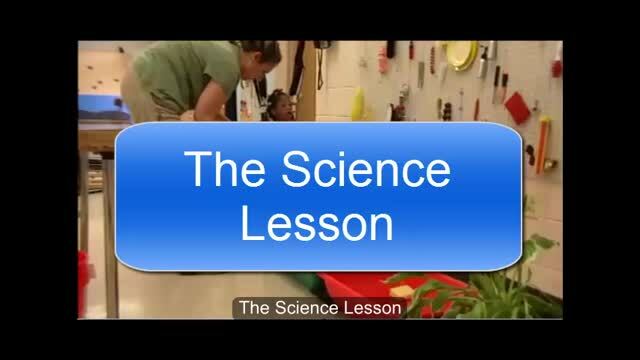 In the videos below you will see an Active Learning approach to teaching a science lesson about plants and their growth cycle. What both of the students are doing is the basis for all scientific learning – observation, exploration, experimentation, and the development of hypotheses about how the world works. However, we still need to be able to point to specific skills from the General Curriculum to show this connection. Here is a simple science lesson taught in an environment using a HOPSA dress. Play video in a separate tab/window. 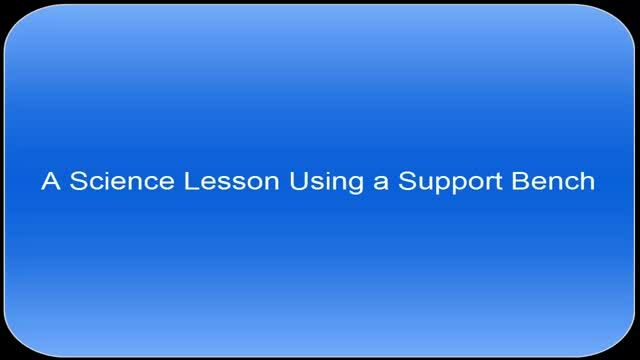 Here is a similar lesson taught using a Support Bench. Description: A science lesson facilitated by using an Active Learning support bench. In this example a student in a 6th grade classroom, the rest of the class was studying fossils. Using an Active Learning approach and focusing on pre-requisite skills, this student explored fossils with the goals of increasing tactile exploration, eye-hand coordination, use of two hands together at midline, and comparing textures (rough/smooth, soft/hard, etc.) The adult could also have a variety of brushes and simply play with them by brushing the fossils in order to add adult-child interaction. Note that in the photos below, a small paintbrush was added and then a headlamp was introduced to encourage directed visual gaze. What follows below are some sample skills in the General Curriculum used in Texas (Texas Essential Knowledge and Skills) in the area of Science at various levels from Pre-K through High School. The activities shown in the video tape relates to these skills. (B) predict and identify changes in materials caused by heating and cooling such as ice melting, water freezing, and water evaporating. (D) explore and recognize that a mixture is created when two materials are combined such as gravel and sand and metal and plastic paper clips. (D) identify changes that can occur in the physical properties of the ingredients of solutions such as dissolving salt in water or adding lemon juice to water. At the high school level areas of science become more specific (e.g., chemistry, physics, biology). Still all science areas continue to focus on observation, exploration, experimentation and the development and testing of hypothesizes. - from Texas Essential Knowledge & Skills, High School Physics, §112.39. An IEP goal to address science for a sensorimotor level learner would be easy to write and might look like this. By the end of the IEP completion date, given a variety of materials used in various Science units (as well as other materials) in combination with perceptualizing aids, the student will experiment and explore the properties and characteristics of organic and inorganic objects and materials through tactile exploration using her mouth, lips, tongue, hands, arms, legs and feet for at least 20 minutes of a 30 minute period. This goal also provides a goal related to the Expanded Core Curriculum on developing sensory efficiency.